1. The dog is working if they have a vest on and should not be approached without permission from the person for whom the dog is working. 2. It is not required that service dog wear a vest when they are out in public but it sure does help. 4. Treats for the dog are a nice and thoughtful gesture but not a good idea. 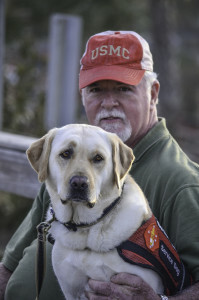 The person with the service dog is generally the one taking care of their every need. 6. Let the person with the service dog in public complete their errands when they are out in public without talking to them. Let them do what they need to as if they didn’t have a dog with them. Ignore them. 7. If someone with a service dog is eating out in a restaurant, alone or with someone else, refrain from speaking to them or trying to engage their dog by waving or talking to either of them. 8. Just because a person asks to pet a service dog it does not mean they have permission to do so. Asking is not a yes. Do not be surprised or insulted if you are told no. 9. Remember you are not the only one who asks to pet the service dog or talk to them – easily 3 to 5 people want to do this every time they are in public. 10. Please do not ask why a person has a service dog, as this is personal information. Someone may volunteer it but if not then it is rude to ask. Maybe that person has PTSD, or a fatal disease, whatever it is it clearly is not anyone’s business but their own. People who have service dogs love them, love the people who train them for years, and love that the public admires their dog. They also love to have some privacy when they are out and about. That’s it. A service dog and their person have developed a bond only the two of them understand. They are a team.